Bangkok is becoming more and more expensive, but it’s still possible to be a backpacker in Bangkok and do a lot with little cash. Given I live in Bangkok, my first thought when I read that was: is he having a laugh? $20 seems very little on which to spend a day exploring the Thai metropolis, so I decided to price it out. $20 would have been around 800 Thai Baht when Mr Kottke was visiting – unfortunately the dollar has weakened considerably since then so $20 is currently worth 650 Baht. 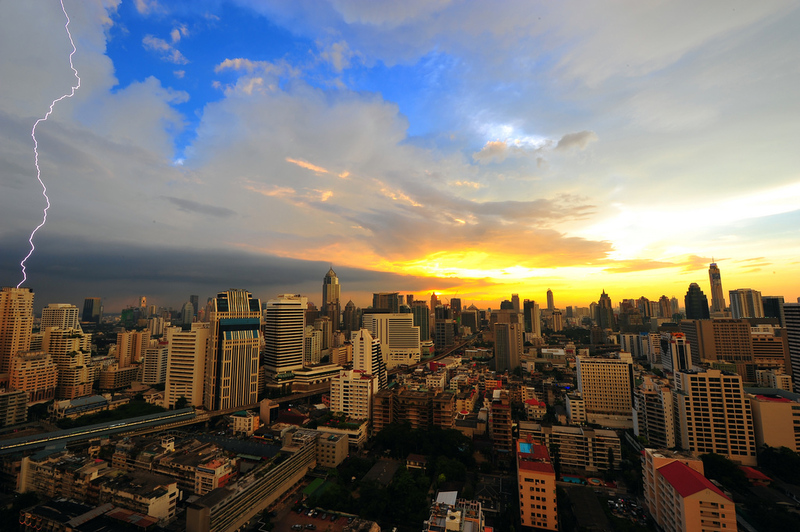 If you want to do and see things in Bangkok, this is probably not going to be sufficient as a daily budget – but $30 a day – or 1000 Thai Baht – could definitely help you enjoy the city to the full. Here’s what I came up with, taking it from the point of view of a typical backpacker who’s arrived in Bangkok early in the morning at Khao San Road. Get a room in the morning at the Wild Orchid hostel just off the Khao San Road by the river in the Pa Athit district. Wild Orchid’s cheapest rooms are 200 Baht a night (last time I checked anyway) – big enough for a single bed and your backpack. They are cell like in a monastic rather than jail sense. WO is well decorated and the shared bathrooms are bright and well-maintained, with nice tiled decor. There are plenty of other cheap Bangkok hotels in the same area – follow the link for more of my own favourites and other recommendations. From Ricki’s it’s a very short walk to the river taxi. This is a quintessential part of experiencing Bangkok and incredibly cheap – 12 Baht will get you all the way from Pa Athit (the river station at which you are currently located) all the way down to Saphan Taksin, where you can jump onto the BTS Skytrain. Best of all, you get to see Bangkok’s fascinating riverfront, with skyscrapers, shrines and slums side by side. For this journey though, you want to get off beforehand, at Tha Tien stop. When you get off at Tha Tien, you are a very short walk from both the Grand Palace and Wat Po, two of Bangkok and indeed Thailand’s essential sights. Yes, both attract a lot of tourists, but they are not touristy places – they are both the seat of the royal family’s power and the resting place of Thailand’s most sacred holy relic, the Emerald Buddha. Exploring both will take a couple of hours at least and probably take you up to lunch time at 12pm. (Here’s more I’ve written about the Grand Palace and Wat Po). There is an excellent outdoor riverside restaurant at Arun Residence, with an outdoor deck and spectacular view of Wat Arun on the opposite bank of the river. This is back at the riverfront, only a hundred metres or so parallel to the Tha Tien riverside taxi station. While Arun Residence is quite fine dining, the prices are reasonable – a sandwich should be no more than 100 Baht. There are definitely cheaper options for lunch, but few will have such an amazing view in relaxing surroundings. So, by 2pm, we’re over half way through the daily budget. For the afternoon, there’s a few more things that can be done on the river. You can visit the Wat Arun and see it up close by simply catching a ferry across the river for around 10 Baht. I can’t remember the cost of entering Wat Arun (if it has a cost) but it’s unlikely to be more than 100 Baht. One of the best things to do in Bangkok is the Klong tour – seeing the old canals of Bangkok and the people who still live on them from a longtail boat – the impossibly thin and elegant vessels with their propellers mounted on super long crankshafts made famous in James Bond’s Man With The Golden Gun. A klong tour can be several hours long, with stop offs at lots of different places which are of varying interest – you can even choose a version to stop for lunch if you like. Personally, I’m fond of doing a two hour version which takes a big U shaped route around the canals, slowly motoring down the waterways so you can properly see the amazing variety and style of the houses built on the waterfront. And get to wave to the kids who are invariably taking a dip and pushing each other in too. (I’ve written more about Bangkok klong tours if you want more info). Depending on the length of time and your bargaining skills, a klong tour can be about 1000 baht for 2 hours. Therefore if there are four of you, it will be around 250 Baht each. This is one of those times where it’s good to find likeminded people if you can. To catch the boat for a klong tour, you need to jump back on the river taxi and head down to Saphan Taksin river station. The river taxi won’t cost more than 10 Baht. By the time you come back from the klong tour, it will be around 4 to 5 pm. At this point you’ll probably be pretty hot and tired. From Saphan Taksin you’ve got several options. You can get back on the river taxi to Pa Athit and return to your guesthouse to take a shower and relax for a bit; if you can’t face the river anymore you can jump in a taxi and brave the Bangkok traffic in air conditioned luxury. If you are still up for seeing more of Bangkok, you can head away from the river and head into the centre of the city on the Skytrain. If you want to head to nightclubs like Bed Supperclub, best put on your best clothes and get some extra cash. If you head back to your guesthouse, there are scores of places around Pa Athit and Khao San Road where you can find cheap eats for dinner. Rambutree road has some very good places – Khao San tends to be busy and overpriced. Pa Athit itself has some excellent restaurants where Thai students and intelligentsia hang out, but they’re not especially cheap. I overshot a little bit, but you can see that it’s quite feasible to have a full on day in Bangkok for around $30 / $40, including accommodation and food, without feeling like you are purposely economising. You could skip the klong tour and take your pick from the huge bunch of things you can do in Bangkok for free if you were really strapped for cash. Similarly, I am personally very fond of my food, so you could probably shave a few baht off each meal expense, but it’s important to remember to eat well and healthily when travelling. Instead of the Grand Palace, Wat Po and the Klong Tour, there are plenty of other places in Bangkok, like Jim Thompson’s house, which you can go and see instead that cost around the same sort of money or less. Therefore if you spent several days in Bangkok, a budget of $30 a day would be fairly consistent over each day. I think the hidden costs of travelling are actually partying and shopping. Booze in Thailand is cheap – it’s a couple of dollars for a bottle of beer – but drink 2 or 3 beers a night and it quickly adds up. Cigarettes are also cheap – but a pack is another couple of dollars a day. Similarly with shopping – Bangkok is a shopper’s paradise that’s awash with fake designer goods and tshirts etc. Once you start snapping up bargains it starts to chew up money quite quickly too. Remember too that Bangkok is not necessarily representative of all of Thailand. Accomodation in Bangkok is cheap because there is so much of it – on places like Koh Phi Phi and other Thai Islands, accommodation can get expensive and the cheap options where they exist are often squalid. That said, if you find a decent beach hut for 300 baht a night and do little else but soak up the sun and drink a few beers for a few days, a week in Thailand is going to cost you a lot less than $30 a day. Mr Kottke, then, is right – fair enough, it’s perhaps a little more expensive than he maintained, but the principle is sound. Even if being in Thailand cost you $40 or even $50 a day, it is still probably a lot less than what you spend at home on all sorts of ephemeral stuff that you don’t really need. I bet there are plenty of younger, less portly people who have spent time in Bangkok and Thailand on a lot less than $30 a day – I’d be interested to hear what sort of schedules they kept to keep their expenses to a minimum. Comments as always appreciated below. 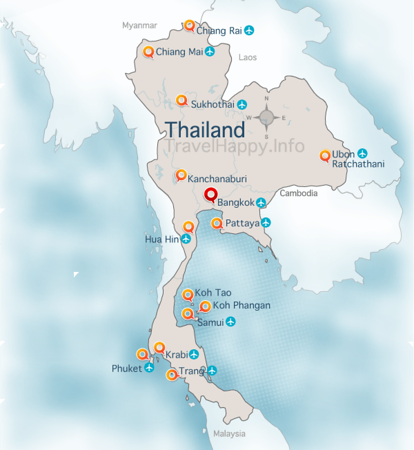 If you’re looking for more ideas about what to do in Bangkok, check Travelhappy’s Things To Do In Bangkok section; my favourite Map of Bangkok which helps you get around much easier than a guidebook ; my favourite Bangkok Restaurants, Cafes and Bars – plus Bangkok Day Trips if you want to get out of the city without going too far.